Swingarm: AThe new SX-F generation features a reworked cast aluminum swingarm. The updated design offers reduced weight and an optimized flex behavior created with a single-component casting process. The weight reduction is 250 grams. Graphics: Red Bull KTM Factory Racing Team graphics. To give you wings. Handlebar: Orange anodized CNC-machined triple clamps feature a rubber damping system, Neken handlebar and ODI lock-on grips. These triple clamps have been something of a KTM trademark for years. Ensuring a precise handling, they perceptibly support the flex characteristics, and with it, the action of the forks. The newly developed rubber damping system for the handlebar clamp reduce the vibration level. Of course the clamps retain their forward and back adjustability for any rider preference.? Monoshock: The new generation of monoshock made by WP Suspension has been developed for the new SX models in conjunction with the new frame and swingarm architecture, including the reworked linkage system and the new WP forks. The linkage system has also been reworked with a revised geometry and longer pull rods, which was tested last season in most of the KTM factory bikes. Forks: The KTM SX models are fitted with a revolutionary new and super-lightweight WP fork, a 48 mm USD air-sprung fork developed by WP Suspension in close collaboration with KTM. It is a split fork with separate functions for each fork leg. The damping functions are on the right side, whereas the air spring is in the left. The left leg features a capsuled air cartridge. This air spring is easy to adjust to any rider weight via a single air valve and a standard fork air pump. The right fork leg integrates a completely new damping cartridge to fit single damping leg requirements, and the damping can be adjusted to the track conditions or the rider’s preferences with a twist of a dial. The new fork with approximately 300 mm travel has outstanding response and excellent, very consistent damping characteristics, while also with a reduced weight of 1.4 kg compared to its predecessor. Triple Clamp: Top quality, CNC-machined triple clamps have been something of a KTM trademark for years. Ensuring a precise handling, they perceptibly support the flex characteristics, and with it, the action of the forks. For MY 16 the upper triple clamp features a newly developed rubber damping system for the handlebar clamp in order to reduce the vibration level of the handlebar. The clamps retain their forward and back adjustability for any rider preference. Weight reduction: The main target for the KTM engineers when developing the new SX-F generation was a massive weight reduction in conjunction with improved handling. The resulting loss of 7.9 lbs is outstanding, making the new KTM models the lightest bikes on the track. Engine: With new features such as more compact dimensions, stronger performance throughout the rev range and a weight reduction of 4 lbs, this newly developed powerplant is the lightest 450 engine on the off-road market. With a reworked single overhead camshaft cylinder head and the latest electronic fuel injection, the 450 SX-F has unrivalled power of more than 62 hp and a highly efficient power delivery. Crankshaft: The 450 SX-F's crankshaft features 10 % more inertia (without increasing weight) and utilizes a shorter connecting rod over the previous model, which contributes to an overall compact and light engine with a snappy power delivery. A higher balancing factor reduces the vibration level. A plain big end bearing with two force-fitted bearing shells runs directly on the crank pin, and the overall design offers the customer lengthened service intervals. 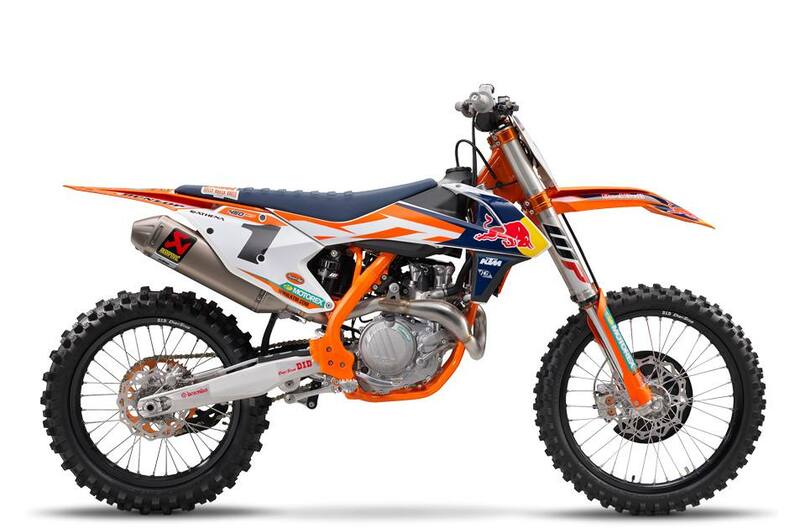 Electric starter: Like all KTM 4-Stroke motorcycles, the 450 SX-F is started with ease by pushing a button. Demonstrated time and time again, an electric starter can become an invaluable advantage in the heat of competition. Clutch: The 450 SX-F employs the KTM-developed DDS clutch (Damped Diaphragm Steel) with a wear-free steel basket and extremely heat resistant clutch plates. This design is distinguished by employing a diaphragm spring instead of coil springs, which makes for a considerably easier clutch action. The diaphragm spring also leaves sufficient space for a damping system integrated into the clutch hub, which benefits for both traction and durability. Transmission: The new engine of the 450 SX-F uses a lightweight 5-speed gearbox which perfectly matches to the power delivery of the large displacement engine. In addition the 1st and 3rd gears are treated with a special surface treatment for better reliability.